Could Kangaroo Point be the next Bulimba? When it comes to riverside living, it seems Brisbanites can’t get enough. From the exclusive Teneriffe to ever-popular Hamilton and Brisbane’s most expensive suburb of 2018 (with a $1.62 million median house price), New Farm, you can almost guarantee that a spot on the water is an excellent investment in Brisbane. Out of the 20 most expensive suburbs in Brisbane, 12 of these areas have extensive river-frontage. Coming in at number six on the list is Bulimba. Located along the south side of the river, less than 20-minutes drive to the city, in an elevated area with great amenities — it can’t get much better than that. Or can it? With a stratosphere-like ascension over the last few years, all eyes are now focused on a new candidate for Brisbane’s best riverside suburb. Just a short journey across the Story Bridge is some of the most valuable real estate in Brisbane. Kangaroo Point currently sits at number 16 on the ‘Most Expensive Suburbs’ list, and so is not yet out of reach for the majority of buyers. However, with a number of key projects underway in the area, this isn’t expected to last for much longer. The suburb is jam-packed with abundant natural beauty in the form of the stunning cliff faces and extensive park areas — coupled with unmatched city views and a central location — it’s pretty much as good as it gets. While Bulimba offers a large chunk of downsizer-suitable townhouses and terrace homes, apartments reign supreme in Kangaroo Point. With 80% of the suburb’s population currently living in apartments, it’s an area that makes the perfect base for Brisbane professionals. Not only are the majority of houses in Kangaroo Point on quite small blocks, but the added elevation of an apartment provides undeniably grand views over the city, making apartments the most-valuable real estate in the area. The median apartment price in the suburb is currently sitting at $767,500, and this is only expected to increase when a few new exciting projects start construction. 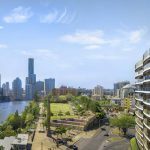 The landmark Banyan Tree Residences Brisbane project, located right on the cliffs at Kangaroo Point, is expected to get underway this year. 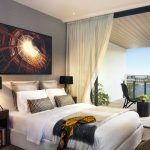 These luxury Brisbane apartments, offering hotel-like living are predicted to be instrumental in changing the face of the suburb; elevating it to a level where Kangaroo Point is sure to give Bulimba a run for its money in terms of lifestyle offering. 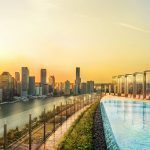 It’s not just the amenities at Banyan Tree which have us excited (although that’s definitely a factor too), but the rise of the transition of the entire suburb that will happen once the development is complete. Another future game changer for Kangaroo Point is the potential pedestrian and cyclist bridge which would connect Kangaroo Point directly to the CBD. The business case is currently underway for this project, after it received funding from the state government in late 2018. With unparalleled views, riverfront access, landmark residential projects and potential infrastructure that would change the shape of not just the suburb, but the entire city, there’s no denying Kangaroo Point is on the up-and-up. While it still has quite a few places to climb to join Bulimba in the upper-ranks of the ‘Most Expensive Suburbs’ list, it’s now a matter of when, not if, Kangaroo Point will join the big-boys league of Brisbane’s most enviable suburbs. 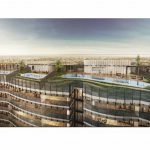 Top 5 luxury Brisbane apartments for sale now!